Up and down. Up and down. Through all your day-to-day comings and goings, the garage door rarely complains. That said, for the door to continue operating without a hitch, it needs a simple course of maintenance on occasion. Here's what to do. No matter whether you use muscle or a motor to open and shut your garage door, it’s going to need TLC every so often to continue operating safely and smoothly. 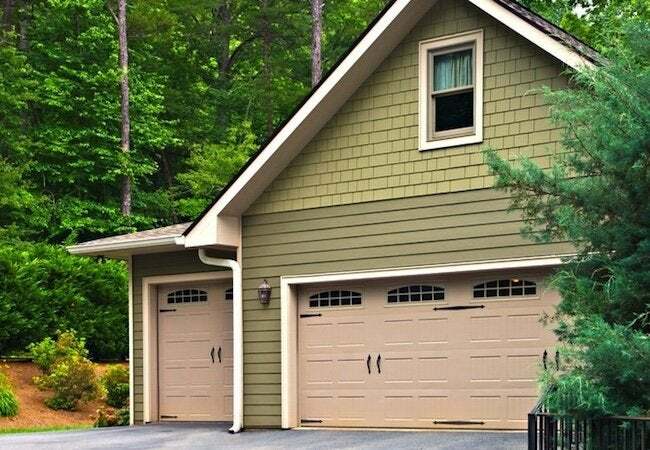 To get started, stand inside your garage and, in the course of raising and lowering the door a few times, note all the moving parts, including hinges, springs, and rollers. You may want to wear a pair of safety goggles, along with a shop apron, as a way of keeping dust and oil off your clothes and out of your eyes. Now, with the door closed, use a rag to wipe away any dust, grime, and cobwebs you can get at (you’ll probably need a step ladder to reach the overhead tracks). Next, squirt a bit of silicone spray onto all the moving parts of the assembly. Repeat the process with the door opened to about the halfway point. That’ll ensure the lubricant coats all the components involved in guiding the door on its back-and-forth journey. Don’t forget: Pay some attention to the rollers. Use a straw applicator to send lubricant into their centers—the part the axles go through. As you go about this final task, keep a rag handy to wipe away the excess drips. You see, it doesn’t take much effort to keep your garage door in tip-top shape. The hardest part is remembering to get out there and do it!